One of the main set-pieces of US, EU and NATO member state foreign policy towards Russia is the claim that “Russia invaded Crimea,” a cardinal sin which can only be expunged by Moscow relinquishing its new acquisition. As punishment, the West have imposed punitive sanctions on Russia along with a near full economic embargo on the Russian Federation’s newest member, Crimea. Also woven into this stalemate is the linchpin of US and NATO’s geostrategic marriage of convenience with the Ukraine, namely, an ‘unwavering’ promise to Kiev by the West that they will do everything in its power to somehow ‘repatriate’ the Russian-speaking Crimean region to the Ukraine. If the collective commitment behind that promise ever comes into question, then the covalent bondbetween US, EU and Ukraine will weaken significantly, which may eventually steer Kiev toward the unimaginable – reestablishing sane bilateral relations with Russia. According to recent remarks made by one Italian parliamentarian, that day may be approaching earlier than Washington and its partners would care to admit. Stefano Valdegamberi, deputy of regional parliament of Venice intimated in a recent interview (see passage below) how the current EU policy of frozen relations with Crimea could begin to thaw after the next election cycle. Far from happenstance, there are a number of practical reasons why this shift was bound to occur. As a result of the Trump Administration’s aggressive trade policies, along with its apparent inability to honor its international treaties and commitments, most notably with the Iran JCPOA Nuclear Deal, Brussels has been allowed to drift away from Washington’s gravitational pull, and build independent trading mechanisms of its own in order to allow EU members to honor the JCPOA terms and maintain normal relations with Iran. Concerning the Iran deal, Washington had to choose between following the dictates of the Israeli Lobby, or honoring its multilateral agreement with the P5+1 signatories, and it chose Tel Aviv. Such shortsightedness has potentially opened a new door between Brussels and Moscow, as both parties desire partners who exhibit normative traits and consistent behavior – neither of which Washington has been able to offer under the current regime. Recent large-scale NATO sabre rattling may appear ‘high-profile’ through the lens of a defense-friendly mainstream media establishment, but ultimately, for European lawmakers the military imperative will be subservient to the attraction of positive trade and diplomatic relations with their eastern partners. In other words, US and NATO can only milk the fear card so long before they expend too much credibility in the eyes of greater Europe. Moscow has made it clear to the West, by word and deed, that despite the loud condemnations, it is not prepared to offer any concessions to the US-EU duo. Nor can the US or EU make any coherent case that Russia or the people of Crimea have acted outside of international law. Conversely, a much stronger case has been made that the US and its allies initiated a coup d’etat in Kiev on February 23, 2014. A sober realist analysis of the situation reveals that regardless of the events of 2014, Russia would have found a way to maintain its strategic military interests in Crimea, only the unholy and haphazard alliance between Washington and Kiev created a perfect opportunity for Moscow to expedite a reunion with its former territory on the Crimean peninsula. The West’s current conundrum is further compounded by the fact that the US and EU’s ‘smart’ or targeted sanctions – are not designed with any practical coercive objective in mind other than to show resolve and ‘send a clear message to the government of Vladimir Putin’ by punish individuals and businesses, with the intention of weakening and destabilizing the Russian and Crimean economies. As far as Italy and other European countries are concerned, all economic stakeholders are losers under the current isolation and containment framework, with European actors forced to participate in what is ostensibly a geopolitical chess match between Washington and Moscow. Many EU members are struggling to see the benefits of this zero sum game. Arguably, no other country has consistently voiced as much opposition to this US-imposed crisis than Italy. The deputy of regional parliament of Venice Stefano Valdegamberi stated during the “Crimea in a Modern International Context” conference that the pressure of European sanctions is felt not only by Crimeans, but also by the citizens of the European Union who are interested in cooperating with the peninsula. “The first time I visited Crimea was 3 years ago on the occasion of the International forum, and when I returned back to Italy I described the prospects of development in Crimea. I spoke in the regional parliament and spoke about the situation that exists, and the deputies of Veneto voted to recognise Crimea as a part of the Russian Federation. In the European arena there are comments about Crimea being occupied by Russia – this is completely false information. The decisions on the sanctions plan that were made in the EU aren’t correct in relation to Crimea,” noted Valdegamberi. “Over the past few years the situation in Italy has changed concerning Crimea. Thanks to the results of the last three years, a new government came to power that supports Crimea and understands the situation that has now developed on the peninsula. A few days ago Matteo Salvini was in Moscow, and has said that Italy recognises the decisions made in Crimea,” said the deputy. The politician has also expressed confidence that at the upcoming elections in European Parliament the situation will change in favor of the Crimean peninsula even more. Also he has given several examples of violation of the rights of the Crimea. 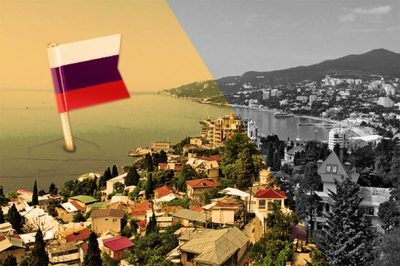 “Last year the police came to the Vinitaly exhibition in Verona and confiscated the wines that were presented by Crimea. The sale of Crimean wines in the European market is blocked. A week ago my friend went to Crimea, he brought equipment for construction. In fact, he had to go there illegally, because if Europe learned that this businessman was here, his accounts could be arrested. Money transfers are blocked, the exchange of the necessary equipment is blocked. It is impossible to send tourists to Crimea, it is impossible to do business in Crimea, and many Italians would like to be engaged in business here. Many ask me already every day how it’s possible to develop tourism and agriculture here. Unfortunately, officially they can’t do it,” said the deputy. “In fact, it is direct violence against the will of the citizens of the European Union. When I return I will speak about all these problems in Italy and I will try to further avoid them,” summarised Valdegamberi. While Crimea may be cut off from the West economically, Moscow is gradually building up infrastructural improvements, including projects like the Kerch Strait Bridge which will further increase Crimea’s transport and trade capabilities, and offsetting any reliance on the Ukraine for subsistence. Aside from this, these type of investments are hugely symbolic and will further endear Crimea to Russia, as opposed to Kiev. The idea in Washington that this reality can somehow be reversed is but a post-modern projection on the decaying wall of Neoliberalism and R2P vindicationism. The real danger is that desperate hawks in Washington and Kiev will try and undermine any peaceful outcome so as to extend the status quo indefinitely. The biggest beneficiary of a continuation of hostilities has to be NATO and the military industrial complex whose entire forward-planning policy and commercial agenda rests solely on the maintaining heightened tension between the Russia and the US-EU, with the Ukraine being the epicenter of that effort. To date, most of the Western mythos for Crimea has been preserved through a sustained propaganda blitz, waged by the western government-media complex since 2014. As time passes and the daisy chain of repetitive, emotive talking points continues to fold under the weight of reality, Europe’s eventually acceptance and recognition of Crimea as a friendly outpost for trade and tourism – is inevitable. The same is true for European relations with Russia. The days of unipolar hegemony are rapidly shrinking in the rear view mirror of history. The sooner Washington’s foreign policy blob realizes this, the better off everyone will be – including Washington.